paul gregutt's washington wine blog – unfined & unfiltered: when, where and how should you submit your wines for review? when, where and how should you submit your wines for review? I began writing a weekly wine column in 1987, and I’ve had one in print somewhere ever since. About 12 years ago I was invited to join the tasting panel at Wine Enthusiast, and given the Pacific Northwest wineries as my territory. At that time, I adopted the 100 point scoring system, which has proven to be both useful to the trade, and helpful to consumers, despite the reams of critical prose it has attracted over the years. In the past dozen years or so, the number of wineries in Oregon and Washington combined has roughly quintupled. Given that spectacular growth, it has been a pleasure to see how few wineries have opted out of having their wines reviewed. Oddly, it is rarely wineries that have received lackluster reviews that stop sending in new releases. It is more likely to be wineries that have been praised, but have decided that either they no longer need the publicity, or were not getting as much praise as they felt they deserved. Speaking for myself and my editors, we encourage all wineries to submit new releases, especially the acknowledged leaders. Having the best wines from a region in the database elevates the standing of all wines. It encourages everyone to improve, by continually setting the quality bar higher. Even if your winery doesn’t need the publicity; even if your waiting list has a waiting list; it would be a service to your cohorts if you would continue to make your wines available for review. If you have not been submitting wines to me for review, I hope you will re-consider. If you are a member of the trade, and have not been reading the reviews posted on the database, I encourage you to do so, and feel free to use them to promote the reputation of the region and specific wines and wineries. They are there to serve the trade as well as consumers. Over the years I have developed these personal guidelines. If they do not answer all your questions, please feel free to write me and I will respond quickly. When mailing wines please do not ship in Styrofoam of any kind! Cardboard is safe and recyclable. It’s always best to confirm your proposed shipping dates in advance, to be certain I will be here to sign for the boxes. For each individual winery or winery brand, please submit new releases twice a year. You may choose any two convenient times, as I taste and review new releases constantly. Please send 1 bottle only if it uses a screwcap or glass or composite cork closure, 2 bottles for wines with standard corks. 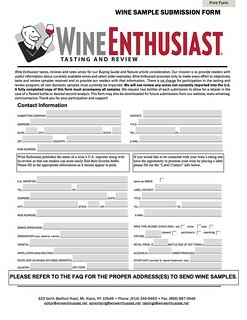 WA, OR and ID wineries must include the current Wine Enthusiast submission form. Please be sure you are using a clean printout of the most recent form. You may download it here. Important technical information to include: blends, vineyard sources, suggested retail pricing, case quantities, % of alcohol, the release date, and the name (or names) of your Washington state distributors. Wines are tasted under controlled conditions in peer group blind flights. One submission is sufficient for consideration for all the different print and online outlets to which I contribute. “The 2013 calendar year will see many changes for WE, with the most exciting being the continuous development of our Tasting and Review Program. In addition to increasing the number of wines reviewed, we have also worked hard to improve the user interface to our free online buying guide at buyingguide.winemag.com. Here are links to all of the forms for the tasting department, which are also available on our website here. Please be sure to refer to the FAQ when submitting samples to ensure that they are directed to the appropriate editor and address. California wines are divided between reviewers Steve Heimoff and Virginie Boone. Please refer to the California AVA Assignments sheet for specific details as to which regions will be reviewed by whom and where samples should be shipped. Washington wineries should submit wines to Paul Gregutt for review. Contact information is provided within the FAQ Information sheet. Wineries from all other states in the U.S. and other Canadian provinces can send their wines to our home office in Mt. Kisco, NY. So far here in the west, 2012 is shaping up to be a glorious vintage. Fingers crossed. As my friend Rex Ziak says, "all hope permitted!"